Chris Says: Phew, I was worried we weren’t going to get our mandatory use of the word “stat!” out of the way early. 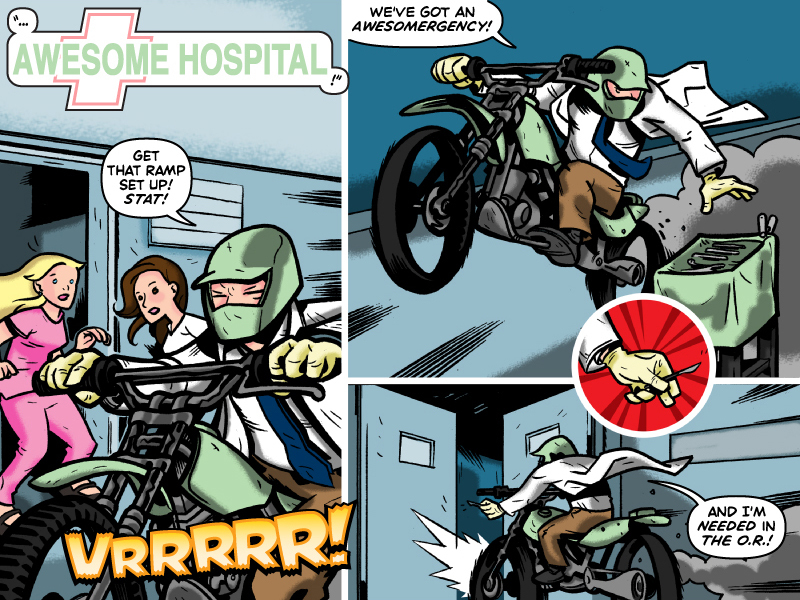 I want a surgeon who rides a motocross bike in the hospital. the closeup on the awesome scalpel-grab made me LOL. LOL. Nice! All the dialogue ends in exclamation points! Very awesome! Love the combined helmet/surgical mask. Are you lads aware of the Awesome Foundation (I think they’re called) a philanthropic organisation that hands out money to support things that are awesome in order to encourage and support more awesomeness in the world? I think they normally focus on awesome charitable or scientific organisations but Im sure, in your field of the arts, it would be worth submitting a proposal for Action Age comics. Loving the concept so far.